The Wild bowed out early yet again, the Flames looked every bit the team with a <1% chance of winning the cup, and the Model went 7 for 8 in first round series predictions. The big (and only) miss came on the heels of the Chicago Blackhawks, who apparently decided they would rather be golfing than playing hockey. Despite the addition of Bruce Boudreau, the superstar-less Minnesota Wild proved once again that they lack a star goal scorer needed to make a deep run in the playoffs, such as a Vladimir Tarasenko. While Round 1 presented zero game sevens, the Model predicts we might see a nail biter or two in the second round. The following table displays the outcomes across 10,000 simulated playoffs from the Semi-Finals and on. 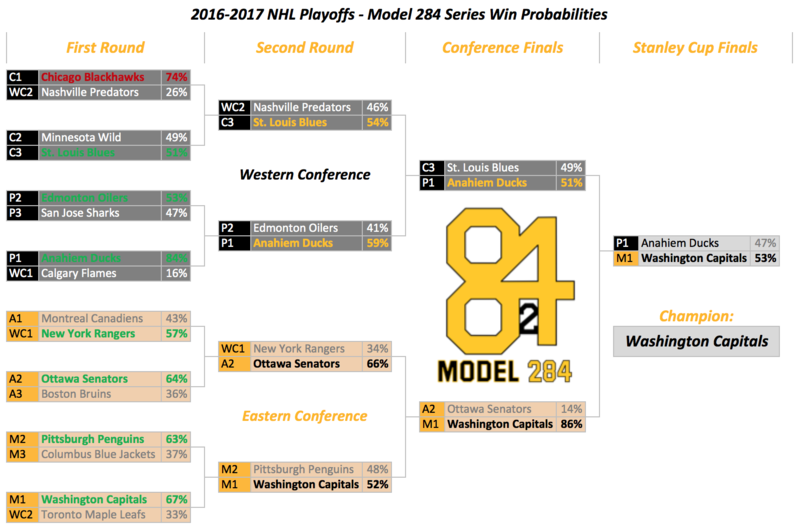 Although predicted to lose in the Eastern Conference Semi-Finals, the Pittsburgh Penguins are the team most likely to win the Stanley Cup according to the Model. The Penguins barely oust the Washington Capitals for the top spot. Any way you slice it, the Model likes the winner of the Caps-Pens series as the favorite to win the Cup.